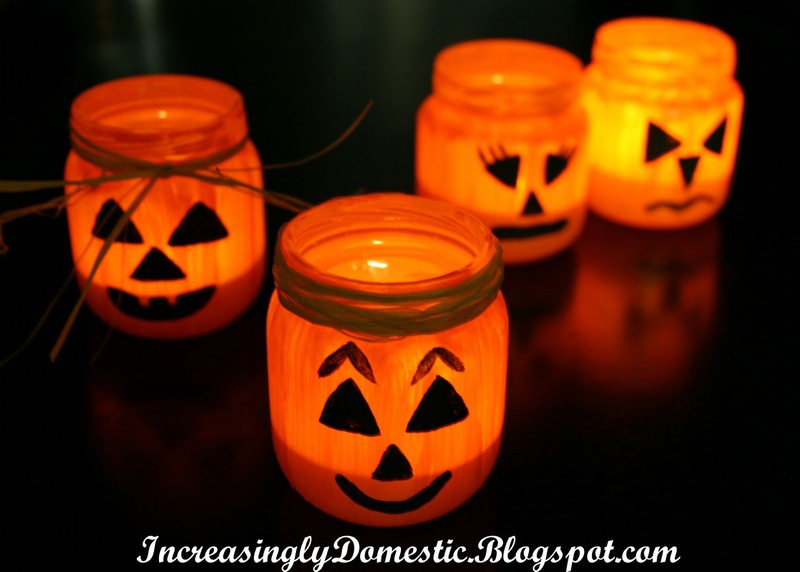 After reading Kasia's Jack O Lantern String Lights post on Dream Home I was inspired to use up some of my glass baby food jars to make something similar. Go check out her post...it's so cute! Here are my Jack O Lantern Tealights! I did things a little different than Kasia. She used food coloring and mod podge to get her gorgeous stained glass appearance, but since I didn't have the food coloring I used orange acrylic paint mixed with the mod podge. Here they are in all their black and orange glory! The candlelight really brings out the brushstrokes in the paint and adds a nice touch, don't you think? I added some raffia around the neck of a couple jars to see if I liked it and think that I will be adding it to the rest of the jars as well. Hello! Stopping by from New Friend Fridays from The Trendy Treehouse. Now following your blog. Looking forward to connecting with you! Oh, so cute and not scary. Great! These are so cute. I saw some awesome glass things at the thrift store but couldn't think what I would do with them so I didn't buy them. I'm going back to get them to do this. One question, do you paint the inside or the outside of the jars? 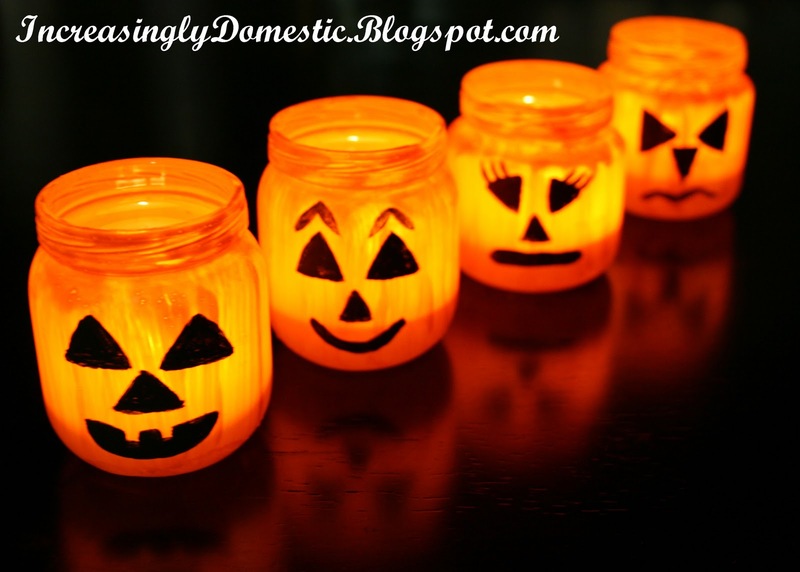 Thanks for linking up to "Get Your Halloween On". so cute! love them! 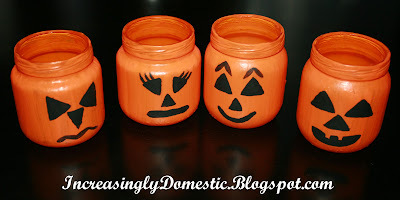 I have a ton of baby food jars, I just might have to make some too! I'm totally gonna copy you! These are too stinkin' cute!! great idea-- found you on a friday blog hop-please come and follow my blog too. They are so cute! Can't wait to try doing some for myself. Thanks for sharing. I LOVE these lanterns...so creative! I'd like to invite you to link it up with my "Open Haunted House" Linky Party on my blog, Moo Moo's & Tutus Party Designs. Oh my goodness those are the most adorable things ever. super cute blog. what a clever idea to re-use jars! new follower from sassy sites. hope you visit us sometime. What a neat way to reuse some old baby jars! I've seen this idea using bigger jars, but I like the cuteness factor of the "mini" pumpkins from the baby jars. Bookmarking this idea! Hi, Amy! Thanks for linking up today & for your sweet comments about my blog! These are adorable! I don't have baby food jars but I do have some other small glass jars that I think will work. Thanks for the great idea. I stopped by from New Friend Friday. Seriously have the same idea and tutorial in process LOL great minds think alike- or just two smart moms trying to recycle! Love them! They look great! Thanks so much for linking back to me! These are so cute -- especially when they are all lit up! Love them! Great way to re-purpose...too bad I didn't think of that before!? My son just moved up to table food about 2 months ago! 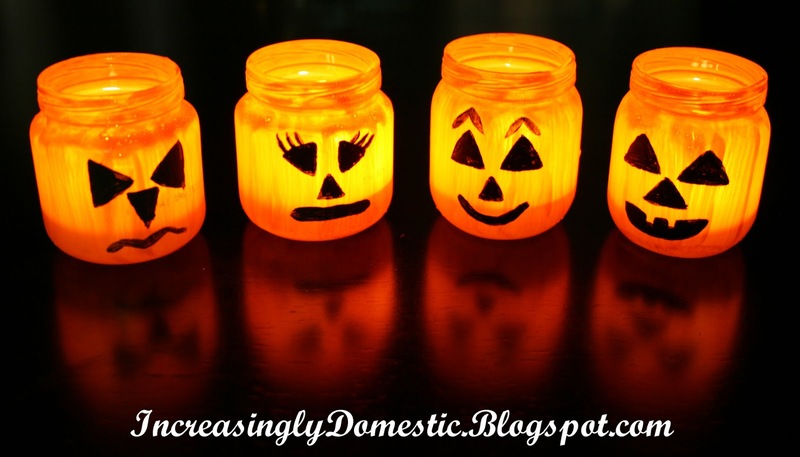 Thanks for linking up to The Halloween Scene! Too cute! I'm going to see what I can find around the house since we're a few years past baby food! Great idea! I love recycle crafts and these are too cute! I made this with Mod Podge and fabric as well as food coloring the Mod Podge and had so much fun! I love all the different ways you can do these! I love that yours are less transparent but glow so beautifully! What a fun use of baby food jars! Very cute! So cute! I knew I should have saved some of my baby food jars!